As you may have read, a member of our community, Meng To, has written a comprehensive book on iOS design and Xcode. We think this is great, so we have ten copies to give away to the members of Designer News. In the spirit of friendly competition, we want you guys to design a home screen for a potential Designer News iOS app. 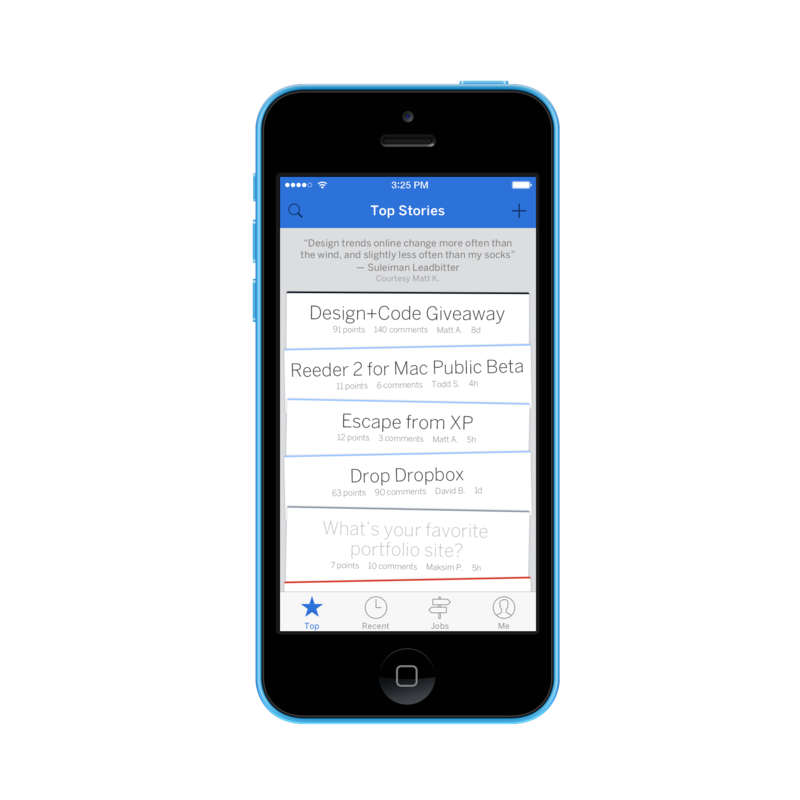 Our favorite ones get the book to build the app and a LayerVault t-shirt. 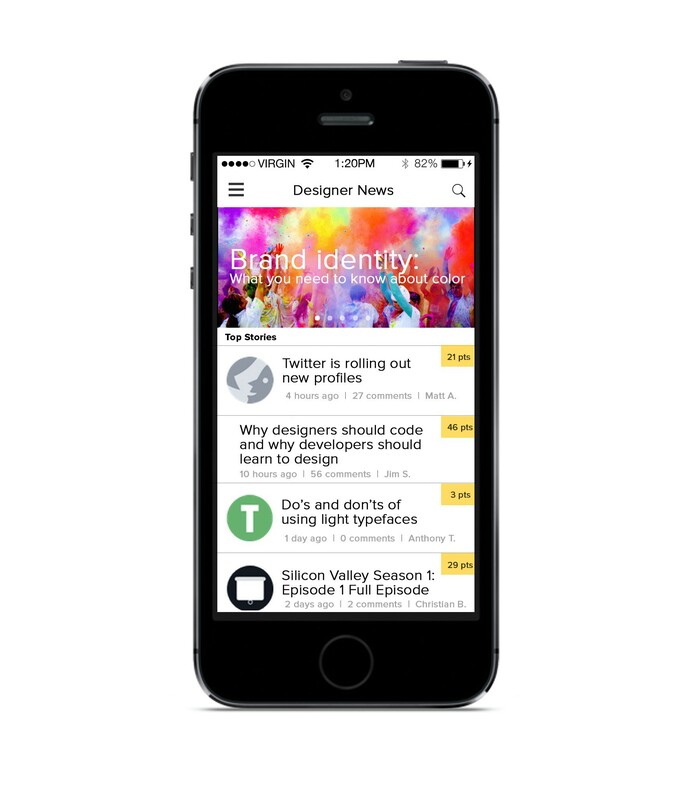 Design a single home screen for an iOS Designer News app. Use your existing LayerVault account or create a new one and create a public project. Post a link to the LayerVault project and an image of your design here in this thread. We'll accept submissions until next Friday (4/11/2014) at midnight EDT and notify the winners via e-mail. Note: We’re not trying to get work for free, just attempting to provide some direction on what gets designed. The app and design will remain yours. I would love to win a copy of Meng To's book! Great inspiration. This is awesome, Raquel. I like it! Reminds me a bit too much of iOS 7's colors. Another problem is that using colors in place for the category icons forces us to memorize the colors. Another problem is the upvote and comment buttons will look obnoxiously big if the title falls into three lines. Thanks for the feedback. I'm just gonna try to explain why I did certain things. There are no colors in the original designer news app, so my guess was that it isn't that important. It's just a fun extra to break the white. In most cases the title says enough so you know automatically whether it's about design or code or something else, so the colors will become clear when you have a little bit of insight. About the buttons, you might be right, but it doens't bother me.. It's something that is very common in app design. I don't say that it's the best solution, but. Very clean - great work! Lovely to hear that you like it Jared =) ! Another problem, in addition to the few others that have been mentioned: there aren't regular avatars like you've got. I'd switch to a pixel avatar to make it accurate. I don't really call that a problem. If the "client" wants to keep the pixel avatars (which are fun) I can easily change it. Whether it's a circle or a square, pixels or a picture, doesn't really matter. It doesn't affect the UX or usability. +1 Replace "Designer News" with "Drudge Report" and you've got something there. No, this is not spec work. You design an app screen and if we like it, we'll give you a book that will help you bring it to life. The app and the design is yours. The reward is clearly presented. There’s no promise or allusion that more compensation will come if you win. It wouldn't be spec work if every entry received a copy. Competitions are spec amigo. Gotta weigh the associated risks with a "we'll pick a concept" format. Just my opinion. They never said they're building the app. They said you get the book so (if you want) you can. @Chris D No matter what your comment says, every time I see your avatar my brain assumes you are angry at whoever your replying to, haha. Competitions are not all spec work. If you're required to design screens with the promise that if your design is chosen, you'll be given the job, then it's spec work. If they're giving something away and the terms are very clear up front, and they're not taking ownership over your work, it's not spec work. The key to that being, ownership of the work generated isn't transferred or used in any way. Pre-ordered today after seeing this post. Can't wait to dive in. Really cool, can't wait to hear your feedback! Curious, what's the best way to get in touch with you? Twitter? Finally got the chance to make something. I really enjoyed working on this, since I love Designer News. Also, thanks Meng To / Designer News for this giveaway. This looks great. Did you imagine being able to swipe to Recent Stories or only by tapping at the top? Greg, I imagined being able to swipe as well, since the list items don't have any swiping on them. Not 100% sure yet, just a concept! It's really fun and a good challenge to think of the different solutions to making an app for DN. It follows the card principle (https://medium.com/design-ui-and-shenanigans/1a4d5703b4b), just one article on screen, swipe left to discard, swipe right to upvote + save in your favorites list. Unfortunately, Layervault doesn't render custom fonts in Sketch files yet, so you will need to download and have Museo Sans with you in order to see it live, or Dribbble where I've attached a couple of samples. Totally open to critiques and suggestions. I would love this for random discovery in addition to a more traditional list view. I think he means it's a good feature to have a card view in addition to the regular list view. 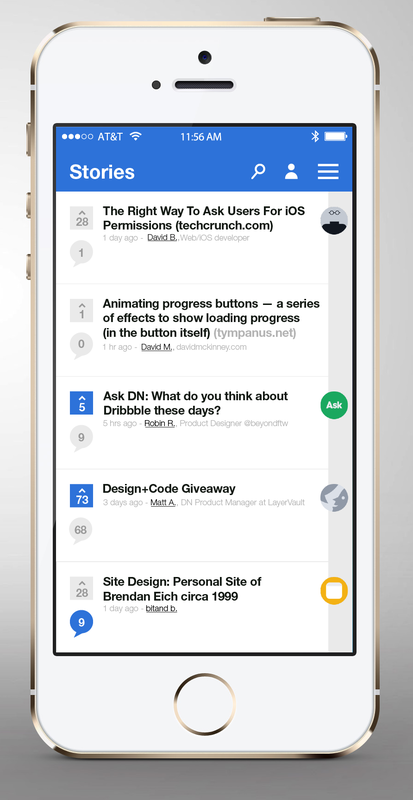 The card-based layout would be good for discovering random articles. But yes, randomness is on my mind. I'm imagining that it could randomly show top stories, not in any particular order. looks neat, i'm not sure from the shot how the navigation would work. For the sketch issue, can't you just convert the text to outlines to solve that issue? Excellent. I think it's important to vary from the default layervault colors/themes. It's one of the only ways to differentiate yourself. You did an excellent job. Thank you! That was always in my mind when creating it, to try be different enough. Everyone stand back... I'm going to attempt design. (Obviously I can't win, just doing it for shits and giggles). It's actually really good. Looks like you put thought into the design and actually executed it well. I don't want to get your hopes up, but I would say you've got a chance. Thanks! There are still some parts that I'm not happy with, but I felt it was good enough to post. Looks nice. I typed your name in when doing my mock so I had to click and see what you put together. I really dig that minty color... FRESHHH! Really, really nice. Great job. I wanted to take a different approach from what you all guys did. It can be improved a lot, but for now, here is my design. Enjoy. Good work, I like what you have done! Thanks for the comment Martin. Realy appreciate it. Best. Awesome job Evan! BTW, what did you use to create your interaction videos? Thanks Jad! The videos were done in After Effects. I like it. Simple and easy on the eyes. Not a ton of clutter. Good job. That is really fun :) and makes me think how many different approaches to a design there are... while there are similiarities in the desings there are also a lot of differences. I now officialy care only about seeing more desings to feed my curiosity! I agree! It was fun designing one as well. Can't wait to see more entries over the next few days. Alright guys, this is my design. 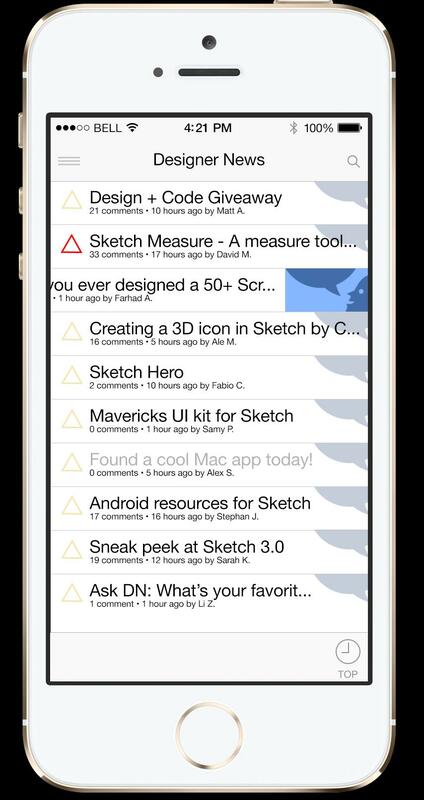 I made it in the Sketch 3.0 beta. Pretty nice. It partly follows the actual website's styles, but takes a unique outlook on them. Good job, mate! Submission Wiki (i.e. Quora's Anser Wiki) would be pretty awesome right now. It's getting hard to keep up with all the submissions. Commenting on the ones you like seems like a good way. But if you weren't doing that from the beginning it might not be as effective. Publicly committing to this so if I don't follow through everyone can call me names. I would also love to get a copy of Meng To's book as well. I tried to make it more fun, trying to make posts seem like articles spread on table. The color on the top the cards is related to what icon is associated with it (ex: black for "Ahem", blue for posts with no icon). 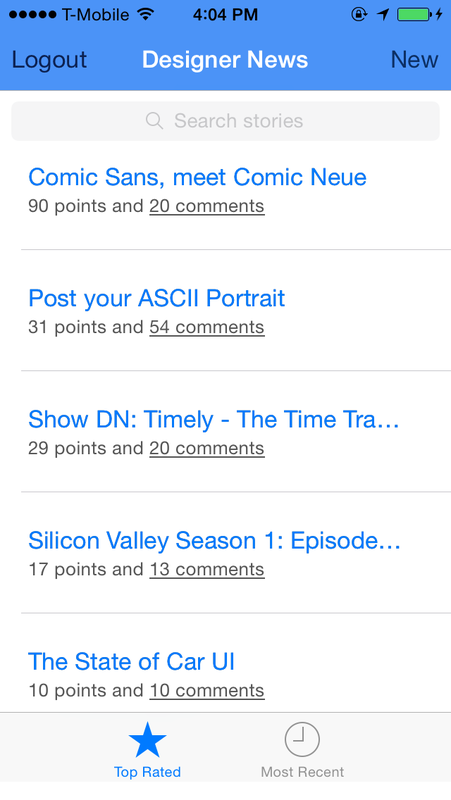 I really like the content of Designer News and that's why I created a 'I feel lucky' kind of app. 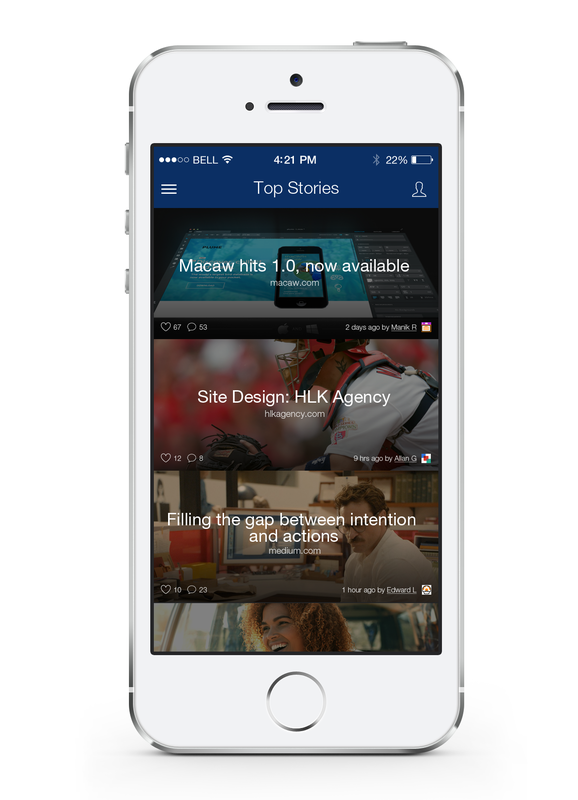 No matter where you tap, you're going to get a great story. You want to know what's good and what's 'now'. Tap, awesome. Tap, awesome. Tap, awesome. 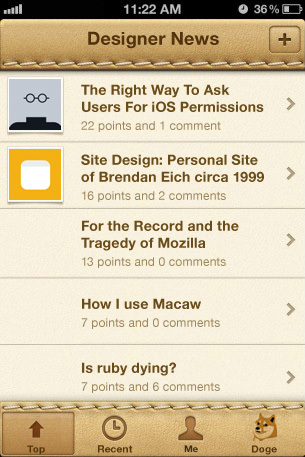 Minimalism to the max: no noise of post categories, votes, comments and titles on your home screen. All in a simple and slick iOS 8 proof design. This was lots of fun. A day well-spent. Hey all, I'm a new member of DN (although not really new in being a follower! ), and I did enjoy this "competition". I took this opportunity to create my first iPhone design, as I never had a previous chance of doing it. Thanks for this opportunity, guys. .
A few words: there are a bunch of improvements and considerations to make. Factors, that weren't accounted for. For example: not every post has an icon. I left aligned the icons because I wanted to introduce the main action (in my eyes) to a tappable area, namely the right. That would be the comments section. But this leads to a gap, when there's a post with no icon (and I bet a huge percentage of posts are without an icon). Further I decided to put nearly all of the information in this main view (upvotes, time, OP, number of comments, link). This makes it very cluttered, but I felt those were necessary. That's why I decided to truncate the title at line 1. This could maybe lead to better, shorter title management to make skimming even easier. Also, I wanted to keep each post at the same height, because posts with longer titles would take away much attention from the ones with shorter titles and I didn't want to waste space there. Having 7 posts in one view with this amount of information seemed fair to me. Additional interactions are explained in the LayerVault presentation. One more thing: I'd strongly recommend everyone to test every design out on the iPhone. Only by doing so you can assure perfect delivery. I've seen some nice looking entries in the browser, but when I opened them up on my phone I couldn't read a thing. Account for screen sizes. Thank you for the advice. My entry is a native app, so it looks best when you build it in Xcode and deploy it on an iPhone. Thanks DN & Meng To! Never worked on iOS Design, but this seemed like fun. Just joined Layervault, here goes nothing! How would you get the cover image? I pre-ordered already, but I'll likely participate anyway. Sounds fun. BTY: I already purchased Meng's amazing work :) Might just buy a couple copies for my friends. This was my first attempt ad designing anything for iOS and it shows, but it was super fun. Took a page out of Meng's own Ripple app. Hope you like it, best of luck to anyone entered. There are some really wonderful submissions on here. This was my first foray into iOS design and I'm eager to do (and learn) more. In terms of my submission, there's nothing particularly groundbreaking, but the emphasis is on a clean and concise home screen view, as per the web version. I've had many an idea as to interactions I would implement and how other screens would look. First Layervault and App Project. *edit: Going to finish every aspect of the design for a final project for school. Hoping I can develop it too! I'll give this a go at the weekend, can I have pity points because my I have all the design skill something that has literally no design skill? A little late, but I figured I'd add mine for fun. This is quite exciting! I have been wanting to take a stab at some form of mobile app design and this is a great opportunity to do so. :D /will edit later. Would this app be used to submit items or would it just be used to read and comment? I was actually going to build this in objective-c since I have most of the components already, but I decided I'd not be an over achiever today. Maybe next week. Whatever you want Joe. It's your app. Hey this is my entry, I'm still a student but i hope i get in the 10 lucky ones. Trying to learn as much as i can and this book would be a great addition to my brain. In this project i wanted to keep as much as i can from the website to keep the same identity on all devices. People who read DN on there computers need to get the same UI as people on there Phones or tablets. Awesome. Will edit this once done. Hopefully I can find time this weekend to get a submission ready! At start was fear that the first wins. Now the guys make not only home screen, but all screens, with icon and splash. Will we see working apps in the App Store until Friday? :) Good luck! Haha, Apples approval process isn't that fast. I was actually going to make mine real, but as i mentioned earlier, I didn't want to be an over achiever. I could probably write my whole concept tomorrow though. I don't think it's a good idea to post the final design in this thread. I think there should be a simple and dedicated site for this contest with all designs sorted as they were submitted. Don't worry, an earlier post does not mean more attention. We will make sure to review all entries. Does it matter how many upvotes you get? I mean it isn't a popularity contest or did I misunderstand it? like everyone else, love it and will update later! A lot of people submitted multiple screens, isn't rule number one to design a SINGLE home screen? I don't think anyone cares if you make multiple screens. Hi Guys. When and where will you be anouncing the results? Edit: Nevermind, i have read the post again.